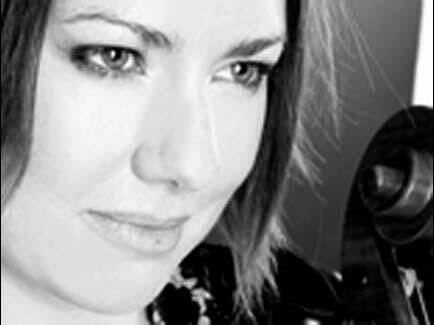 Sarah McMahon began her cello studies with Nora Gilleece at the Royal Irish Academy of Music in Dublin in 1987. In 1995 she moved to London where she studied at the Royal Academy of Music with David Strange, Jenny Ward-Clarke and Colin Carr, graduating in 2001 with a first class BMus and a DipRAM distinction. Sarah is passionate about historical performance and is principal cellist with the Academy of Ancient Music, the Irish Baroque Orchestra and Camerata Kilkenny. She is also regularly invited to play as guest principal cellist with Arcangelo, the Orchestra of the Age of Enlightenment and Aurora Orchestra. Sarah is a dedicated chamber musician and a founder member of the Callino String Quartet. The Quartet was founded in 1999 and enjoys performing a challenging and eclectic repertoire, having worked with numerous composers including Kurtàg, Vasks, Kevin Volans, Aleksandra Vrebalov and Ian Wilson on their compositions for string quartet. They have also collaborated with diverse artists such as the Belcea Quartet, Edgar Meyer, rock band Arcade Fire and jazz guitarist John Abercrombie. Sarah has appeared as concerto soloist with the Orchestra of the Age of Enlightenment and the Irish Baroque Orchestra and featured in a critically acclaimed disc for Hyperion of the Vivaldi Double Cello Concerto with Jonathan Cohen and the Kings Consort. Sarah McMahon gratefully acknowledges the support of The Arts Council and Music Network which enabled her to purchase her cello through the Music Capital Scheme 2009.